Sometimes, the most important decisions are the easiest to make. "I realized very early on that this was the girl I was going to marry, probably a month or two after we started dating," confides Tyler Rhoten of his bride, Lindsey Magness. "She was the girl for me." 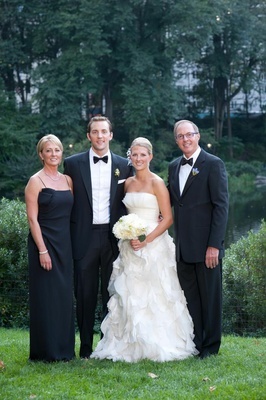 Not long after their whirlwind romance began, Lindsey moved to New York to be with Tyler, and Tyler asked Lindsey's mother and stepfather for their blessing to marry while on a family vacation in Greece. "It was an important thing for me to do for not only myself, but also for her parents to know how much I respected them and their relationship with their daughter." 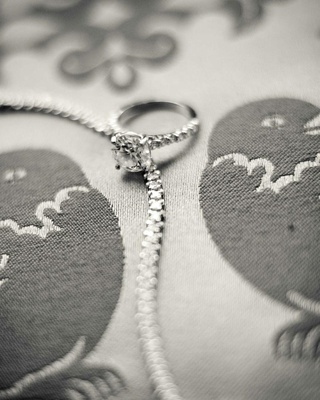 One very sweet proposal later, wedding planning was underway. 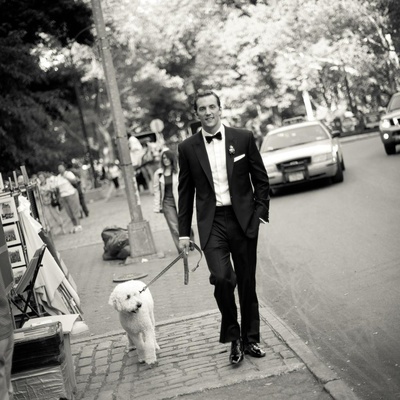 "We wanted to have an iconic New York wedding, which showed our out-of-town friends and family the best of the city we love and call home. Our locations were a big part of achieving that," says the couple. And while anything is possible in the Big Apple, hiccups are always a possibility, too. "Originally, we were planning on having the ceremony at another church, and with only two months to go before the wedding, we found out that the church would be under major construction," reveals Lindsey. 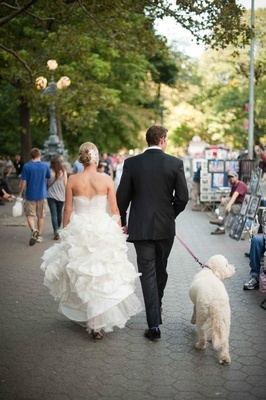 Instead of letting the news overwhelm her, she set out to find a new venue. "In the end, I couldn’t have asked for a better location. Our reverend was wonderful and an absolute joy to work with. I wouldn’t have wanted it any other way. It was meant to be!" 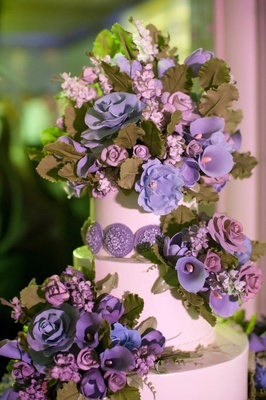 The sizeable bridal party – eight maids in all – wore floor-grazing charcoal gowns and held vibrant bouquets in brilliant hues of purple and blue. 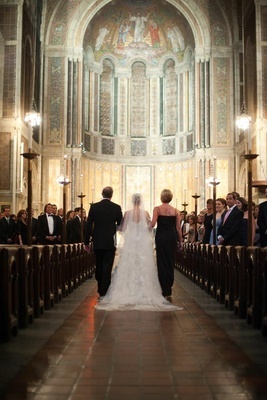 A vision in a tumble of ruffled fabric that fell in origami-like layers, Lindsey floated down the candle-lit aisle, her mother and stepfather by her side. "My Mom is my best friend and the consummate parent for my brother and me. It was very important to me that she, along with my stepdad, give me away." The groom, however, only had eyes for his bride. "She looked amazing," effuses Tyler of seeing Lindsey for the first time on their wedding day, an indelible moment for the groom. 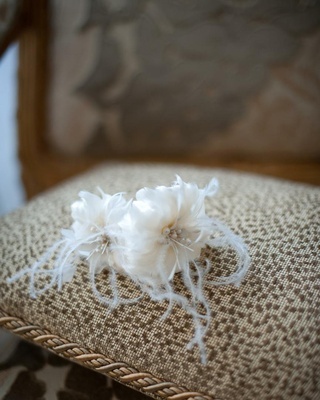 For the bride, one cherished memory stands out among the others. "We are incredibly close with our families and it was really important to Tyler and me that everyone had a role,” she explains. “In the Episcopalian tradition, there is no lighting of a unity candle or other similar event that brings both families together, so we asked our moms to read a poem together. 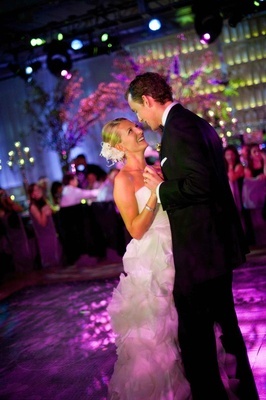 It was definitely a highlight of the night for me to see them standing and reading together." One more magical moment: Just as Tyler and Lindsey kissed after being pronounced man and wife, a gospel choir burst into song, setting the mood for the remainder of the night with their rendition of "Oh, Happy Day," which set the mood for the remainder of the night. 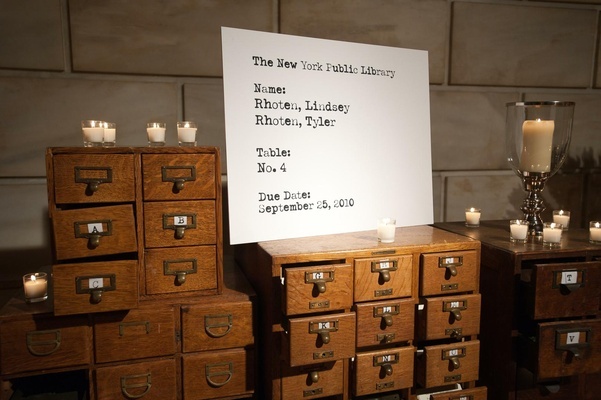 For the reception, guests made their way to the New York Public Library for a night to remember. 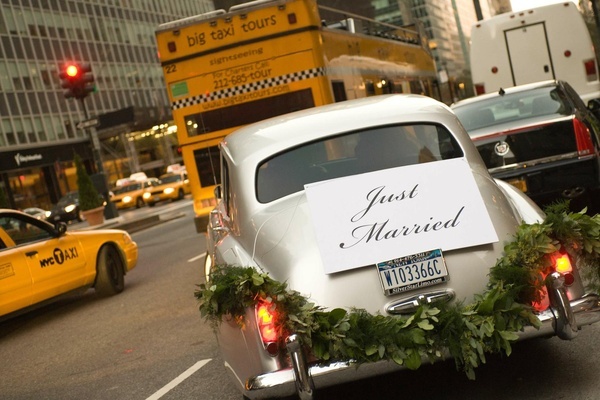 Tyler and Lindsey shared a ride in a classic car, which was fitting for their timeless, New York theme. 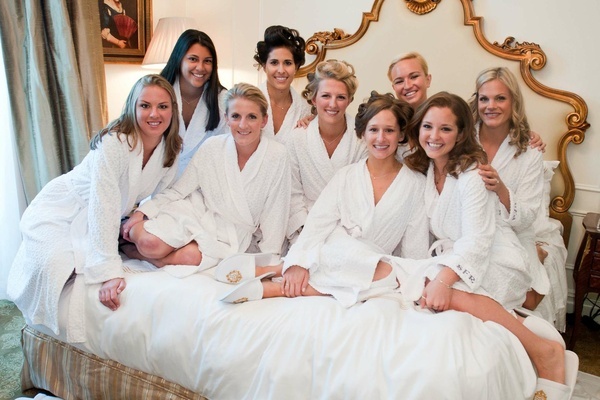 "My advice to any bride and groom is to set aside some alone time, even just five minutes, between the ceremony and reception,” advises Lindsey. “It was so nice to take a moment to appreciate that we were officially married before starting the celebration." 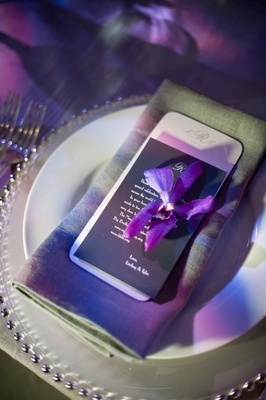 The bride's favorite color palette of black and white, accented with shades of purple, set the backdrop for the elegant affair. 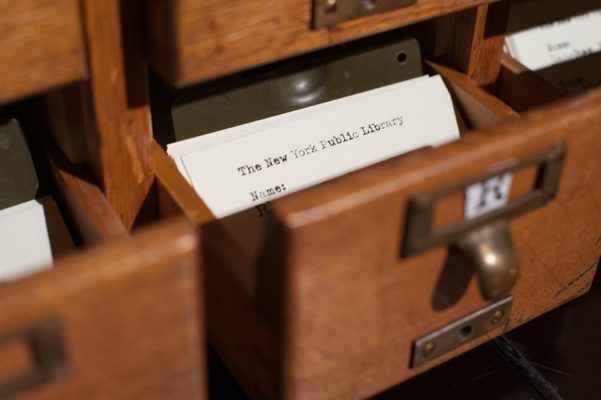 Table cards cleverly fashioned to resemble catalog cards guided guests to their sage-toned seats. 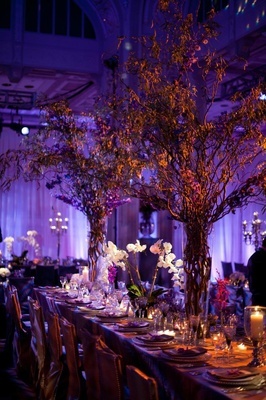 Long rectangular tables filled the immense room, each topped with gleaming silver candelabras and flowering branches of purple blossoms that reached toward the vaulted ceiling. 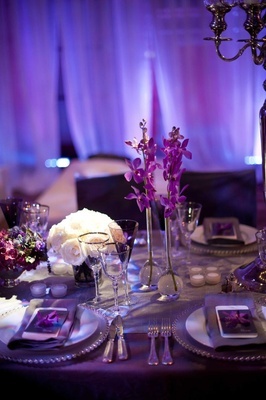 Contrasting short, clean arrangements of white orchids, tea roses, lavender, purple iris, and calla lilies added texture. 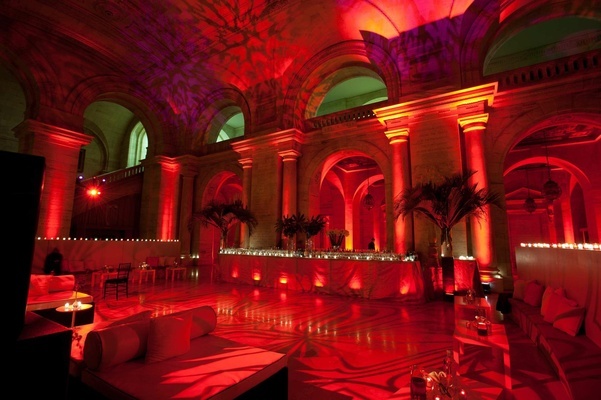 Candles of all shapes and sizes played up the romance, illuminating the hallowed halls. 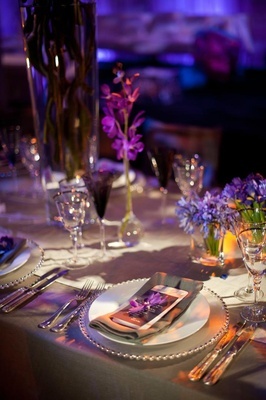 No two tables were identical, a visual feast for the eyes. Violet lighting cast a romantic glow during the dinner and dancing. 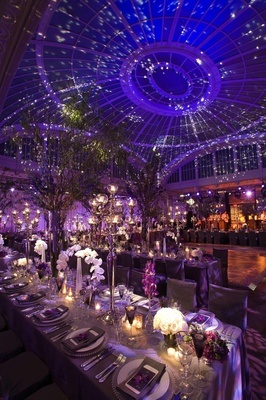 "We wanted the whole reception to be an extension of the dance floor. The band played music that made everyone want to dance and have a great time," says Tyler, a feat for which he takes a little credit. "I was okay with Lindsey and her mom making the decisions on pretty much everything, but I did have a big say in the music," he shares. 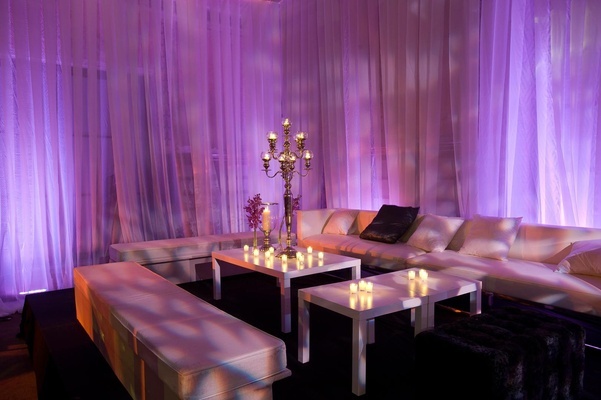 For guests that were less footloose and fancy-free, small lounge areas were provided to sit and enjoy so they wouldn’t feel left out of the action. 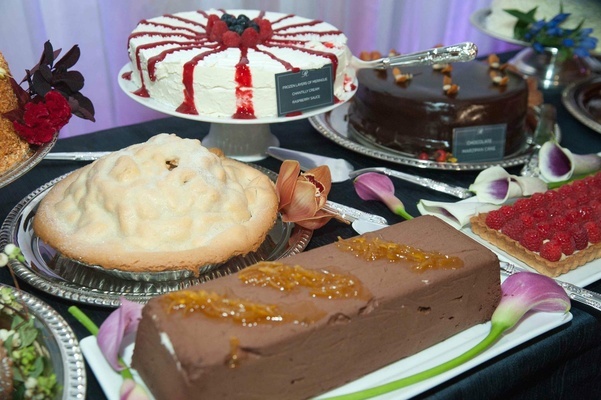 Combining influences from the couple's favorite Mexican and Italian cuisines, guests feasted on a first course of penne with tomato and hot peppers, lasagna Bolognese, and spinach tagliotini with ham and peas. A light salad followed. The main course included a choice of Dover sole or rolled chicken, both accompanied with sides of tomato and roasted-pepper flan, asparagus, and potato duchesses. 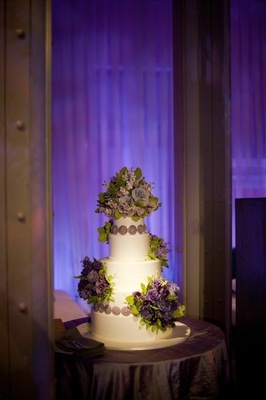 A towering five-tiered buttercream cake was adorned with beautiful bouquets of sugar flowers, ranging from the palest lavender to the deepest plum. The cake wouldn't be the only sweet treat of the night: The ice cream-loving couple surprised their loved ones with a gelato cart serving hand-dipped cones. "It was definitely a hit with our guests!" says Lindsey. In lieu of traditional favors, a donation was made in honor of attendees to two local organizations. However, another tantalizing delicacy served as a sweet reminder of the night. Guests were encouraged to fill a to-go bag with fresh bomboloni (Italian filled donuts). 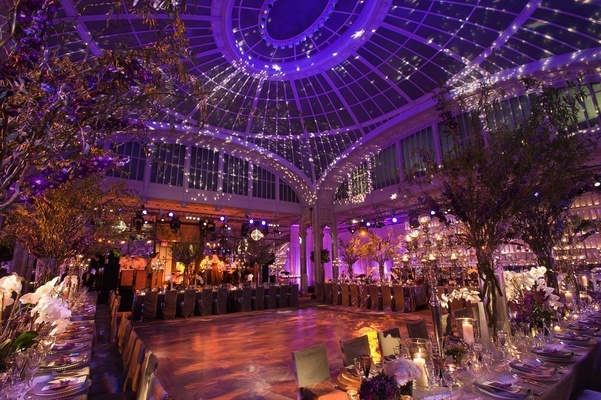 The day was as awe-inspiring as the couple’s iconic venues and, while they wouldn't change a thing about it, the couple offers wise advice: "We wish we would have taken a few minutes to walk through the reception room with our wedding planners before we invited our guests to join us. 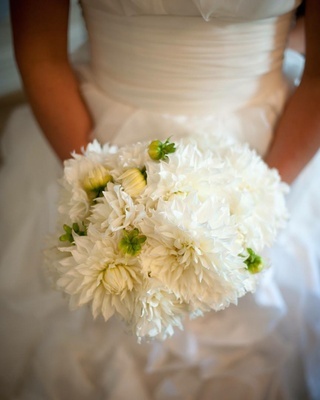 Both of our venues have so much history and culture that even without a wedding occurring they leave you breathless. 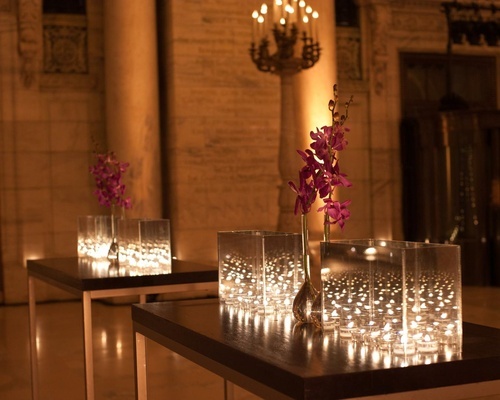 To have a ceremony and a reception there only enhanced what was already there, and our planners did such a beautiful job transforming the space, we would have loved to have a moment to take it all in."